For much of the 2014 Jingle All the Way 5k, Nicolas Crouzier (16:01) remained on Tom Dichiara’s (15:56) heels. Both runners battled for sole possession of the lead throughout the 3.1-mile course. But as the two neared the finish line, Dichiara turned it on to edge Crouzier, and captured a first-place finish among all runners. Dichiara, who coaches the Landon School’s varsity track and cross-country teams, breezed through the downtown course averaging 5:08 a mile. After the race, he said he had incentive to run faster. “We started off and one of the guys was wearing bells. That definitely made me run faster because I didn’t want to have to listen to that for the entire race,” Dichiara, 37, said with a laugh. While last year’s wintry mix provided an idyllic backdrop for the race, the weather this year was far more cooperative. The rain that battered the region for much of Saturday cleared out in time, and while temperatures at the beginning of the race remained frigid, they warmed up as the first group of runners crossed the finish line. “I thought it was a gorgeous morning. The weather was wildly more cooperative, opposed to last evening when we were setting up in the rain. But it was beautiful this morning, there were lots of great competitors and the costumes were amazing,” Pacers Race Director for Events Lisa Reeves said. 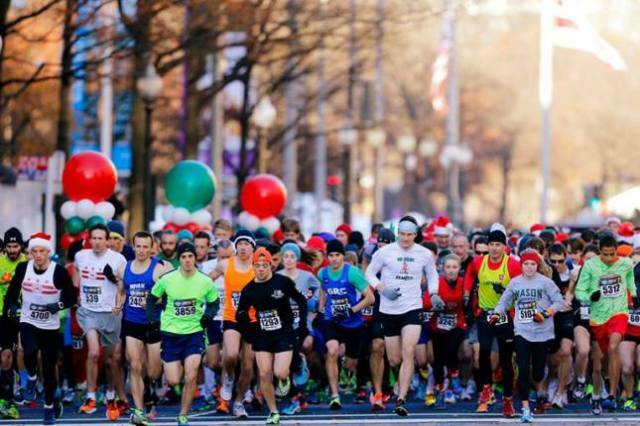 Elves, reindeer, Santa Claus and a human Christmas tree counted among the costumes worn by the more than 4,835 runners who finished the popular holiday race. Last year, 4,403 finished. Former roommates Molly Carpenter (33:52) and Claire Pearcy (33:52) donned complete, matching Santa suits. The two haven’t lived together for a couple of years, but said events such as the Jingle All the Way 5k give them a good excuse to see each other. Carpenter said the race’s festive atmosphere added a unique element that helped make the running more enjoyable. “Checking out everyone’s costumes while you’re running actually makes it seem like time is going by much faster. There’s definitely a different energy among the runners. While it’s competitive, people look like they’re having a lot of fun,” Carpenter, 28, said. While Carpenter and Pearcy opted for a more traditional look, Carolyn Genegaban (41:41) channeled her inner-Martha Stewart to create a wearable Christmas tree that drew the attention of fellow runners and passersby who strolled around the Freedom Plaza area. “Well, I joined as a team, and my team already had a Santa, a Christmas gift and a reindeer. So I had a couple of options. I ultimately thought a Christmas tree would be the funniest,” the 28-year-old Germantown, Md. resident said. Genegaban’s wearble Christmas tree earned first-place costume honors from race judges. Stephanie Lundeby moved from Oklahoma to Alexandria, Va. in July. The 31-year-old personal trainer didn’t waste time establishing herself in the local running community. Lundeby finished first among female runners on Sunday as she turned in a time of 18:29. She also gained a new friend and potential running partner in second-place female finisher Chelsea Bollerman (18:42). Like Dichiara and Crouzier, Lundeby and Bollerman also had their own in-race duel. “Chelsea fell on my shoulder at about the mile mark. She came up on me and it was great to have her there because I was kind of on my own, and I was trying to figure out my pace. It was nice to have somebody there to keep me motivated. She definitely helped me keep my pace,” Lundeby said. This year’s race was also the first for Bollerman, a graduate student at The Catholic University of America. Bollerman and Lundeby chatted for a while after the race to congratulate each other and discuss running together in the future. The friendly rivalries weren’t limited to just the adults. Thirteen-year-old Carmen (22:08) and 15-year-old Alicia Booher (22:53) joined their mother Ivette (25:08) for Sunday’s race. Ivette Booher, 49, said the two sisters enjoy spirited competitions against each other. Sunday was younger sister Carmen’s day as she finished first in her age group.